Laundry detergent brand Ariel, has launched the Ariel Fashion Shoot, a fun campaign for their Danish and Swedish Facebook fans. Instead of using a camera to shoot pictures of pouting fashion models, Ariel has invited their Facebook fans to try to shoot designer clothes with a jam, chocolate or ketchup. 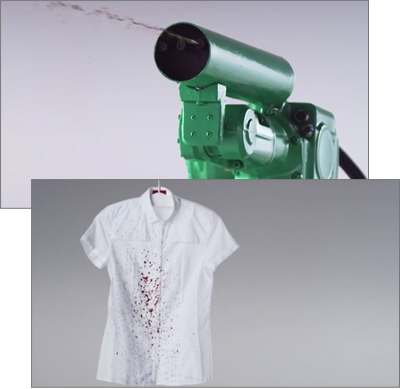 Each day, participants take their turn controlling the robotic spray nozzle and try to hit one of the designer clothing items that is yanked across a line in front of the user. If they manage to stain the item, they win it. The clothing item is then washed in Ariel Actilift laundry detergent and shipped to the winner. They do admit the jam, chocolate and ketchup have been diluted so that they don’t clog up the spray nozzle, but it’s still an interesting and unique demonstration of the capabilities of the laundry detergent. The campaign is broadcast live from Stockholm Central Station between August 29 and September 3 with 1000 pieces of designer clothing up for staining. When it comes to jam, chocolate and ketchup stains, I wouldn’t even need the spray nozzle to win this competition.